Replacement screens find their usage in various cylinders and valves and when used with Acetylene cylinders are known as Acetylene Inlet Screens. These inlet screens are designed with the intention of protecting hand or wrench operated acetylene valves from dust and debris without causing nil to absolutely to hinderance to the flow. 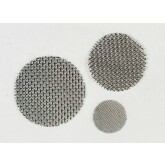 ACETYLENE INLET SCREEN - 1/2"
ACETYLENE INLET SCREEN - 3/4"
ACETYLENE INLET SCREEN - 1"